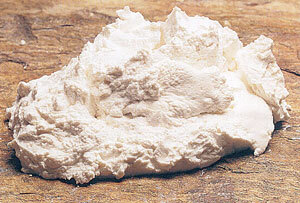 Katiki is a creamy white cheese made from goat’s milk or a combination of goat’s and sheep’s milk. It has a salt content of 1%. Katiki Domokou can be found commercially in Greek and Mediterranean markets, or ethnic grocers and cheese specialty shops. Serve katiki with bread or as a dip with appetizers and mezethes (it goes particularly well with white wine). Use it in stuffings calling for cheeses, with fruit, and in cheesecake recipes. Where a salty taste will do, substitute with soft feta.